The two villas in Campiglia dei Berici designed for the Repeta family, nobles of Vicenza, represent one of the more significant examples of the strong relationship between the ideals and aspirations of their client and their architects’ choices. Unfortunately, there’s no trace left of the first one, designed by Andrea Palladio for Mario Repeta (who wanted to dignify the memory of his father Francesco, a humanist aristocrat, with this villa). The only evidence left is its description in the treatise “I Quattro Libri dell’Architettura”, which conveys the idea of a peculiar building. The villa, in fact, is developed on only one floor and it presents itself as a long portico that contains a vast courtyard on three sides. No ornamental element distinguishes the main building from those destined for agricultural activity. Curiously, the classical pediment (that usually dignified the façades of villas) dominates the passage from the courtyard to the fields. As a result, Mario Repeta’s villa is the expression of an original way of life in which equalitarian Lutheran ideals (which constitute the cause of an anonymous accusation presented against Mario in 1569) and the ellenic culture of Giangiorgio Trissino‘s circle merge. This leads to the refusal of hierarchical orders or discrimination between aristocrats and “peasants”, and therefore to a building regularly marked by columns like the agora. It is a nostalgic memory of the calm and harmonious world of the Greek, open and hospitable like the “House of the Greek” described by Palladio. The frescoes by Giambattista Maganza il Vecchio that adorned the inside walls of the villa should be interpreted in the same manner. They represented the Virtues so that the host could put his friends up in the different rooms according to the virtue that best matched the personality of the guest (“alloggiare i suoi forestieri et amici nella camera di quella virtù, alla quale essi gli parranno haver più inclinato l’animo“). It was, however, an utopia, a plan that mirrored the ideal of a refined humanist suspected of heresy and that would be totally incomprehensible for the successors. 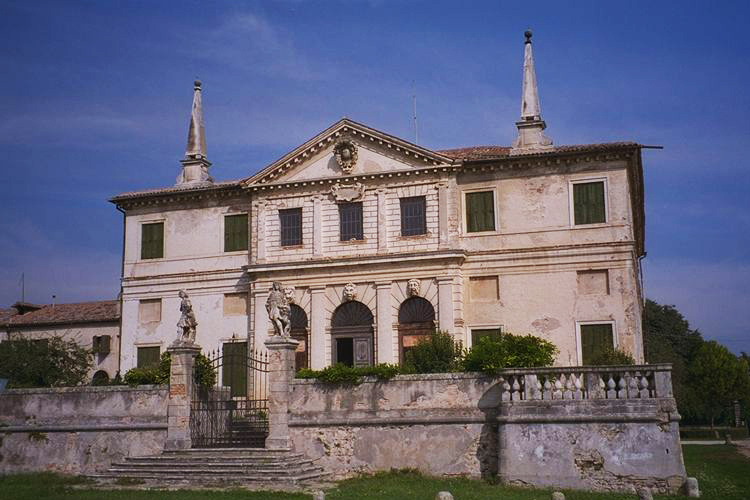 The villa (still existing) built in 1672 for Enea and Scipione Repeta is completely different. According to its clients, it is more elegant than the one designed by Palladio because it best matches the aesthetic ideals of the seventeenth century. 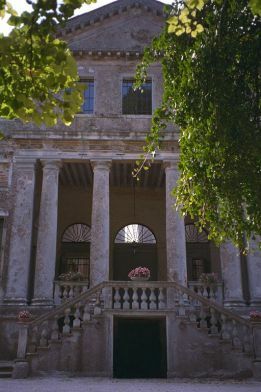 It is a closed and austere building, with a loggia only in the back façade, separated from the main street by a deep moat. This military and feudal imprint was appropriate to the owners of that villa – they belonged to a family that had ruled over the feud of Campiglia since 1217 and that, in order to confirm their feudal rights, was obliged by the Serenissima to do military service, as established in a 1703 document. As a result, the new villa is austere, separated from the rustic buildings and accompanied by a “Serraglio” destined for military exercises. It thus becomes the mirror of the ambitions and aspirations of the feudal lords of Campiglia.